The name of Ricky Dene Gervais (born on 25th June 1961) may not immediately ring a bell in Belgium but in the UK, he's considered as one of the greatest modern comedians. He’s a much celebrated actor and writer for television and film productions. What is that makes this triple Golden Globe-, double Emmy- and seven-time BAFTA award-winner such a hit with his public? In his final year at the University College of London, he formed a duet called Seona Dancing. Two of their singles were released but unfortunately without any success. He started working as an event manager for the UCL before joining XMF, a then small, unlicensed radio station. While working at XMF he met Stephen Merchant with whom he later on co-wrote and co-directed « The Office » and « Extras ». Ricky started his tv career in 1998 with the « 11 O'clock Show ». Two years later he already hosted his own comedy chat show, « Meet Ricky Gervais ». But again it was poorly received and rightly so, because it has been mocked by Gervais himself on several occasions. Ricky Gervais’ real breakthrough came in 2001 when one of his most successful sitcoms, i.e “The Office”, was first aired in the UK. The response was enormous and the show received award after award. “The Office” is said to have changed the face of British television comedy. 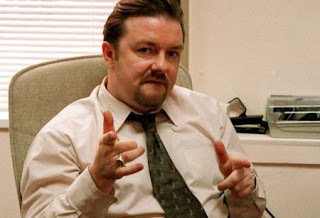 Gervais plays the role of David Brent, a middle-manager followed by cameras during his daily routine. In fact it is a mock-documentary. One of the highlights of the show is the legendary « David Brent dance ». His second very popular sitcom is « Extras », which is a kind of play within a play. Indeed, « Extras » consists in having a visit backstage, where one can see the set and the actors talking with each other. But what one doesn’t know is that those backstage scenes are still being played, which is of course the entire point of the sitcom! One of the reasons why « Extras » has become such a hit is because each episode features a guest star who plays a “twisted”, exaggerated version of himself! For example, the first « Extras », which aired on 21st July 2005, starred Ben Stiller, who played a self-centred director. Other famous stars who appeared on it are Kate Winslet, Daniel Radcliffe, Orlando Bloom, David Bowie, Robert de Niro, Jonathan Ross, and Clive Owen. And last but not least, Ricky is the first British person to have written and starred in an episode of the Simpsons. He also gave his voice to « Bugsy » in the animation film “Valiant” and even appeared in the film « Night at the Museum » as the museum director. Joyce Aerts & Marie Boueyrie.